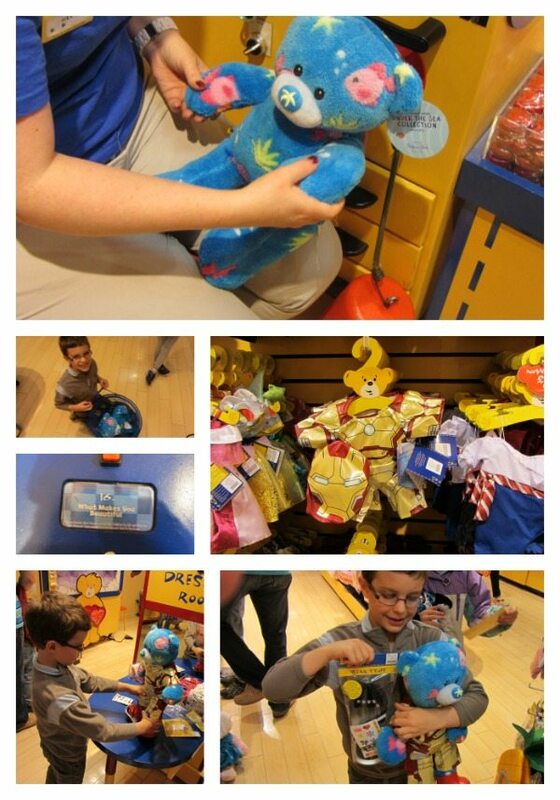 Little star presents….Build a Bear fun! I think I have been living in a cave…I had NEVER been to Build a Bear before yesterday. Make his birth certificate and complete the information for the ID scan inside your bear. It’s a microchip, just like cats can have! Pack him into his special cardboard house to take home, which you can colour in when you get the chance. Phew…who would have thought there was so much to do to make a humble teddy bear? The staff at the shop were uber excited to be helping the kids, and this was infectious – the kids seemed to just go along with everything they said, even the star jumps, and making their teddy bears a “little bit cheeky” by rubbing their hearts against their cheeks! What were the choices / value like for the bears and their accessories? Prices for the bears start at £9.00 for some cute, but simple unlicensed bears. Prices rise to £18.00 for My Little Ponies, Hello Kitty and Smurfs, where there is obviously associated license costs. However, I was pleasantly surprised that the simplest bear wasn’t too expensive. No more than I would pay for a standard soft-toy. Warning though – the add-ons do, erm, add up! As long as you are aware of the costs though, you could keep it relatively simple and get a bear with outfit and shoes for under £25.00. So we got a sparkly blue, very girl-y outfit for a Panda, with an iPod (£38.50 total) and…. …an Under the Sea bear with an Iron Man costume on and a skateboard…so my kids don’t conform to any stereotypes at all, do they (£47.00 total)? In addition, the costumes, and accessories, do look like they will last more than my expected five minutes. Overall Mummy 8/10 and 10/10 from Stuntboy, Chatterbox says 9.5 because of the cost…! Mummy was very impressed overall, but because of the price of the bears when everything adds up, particularly when you have little boys with very expensive tastes (! ), I can’t give higher than 8/10. However, my kids felt differently about the whole trip, and I guess that’s what its all about isn’t it? 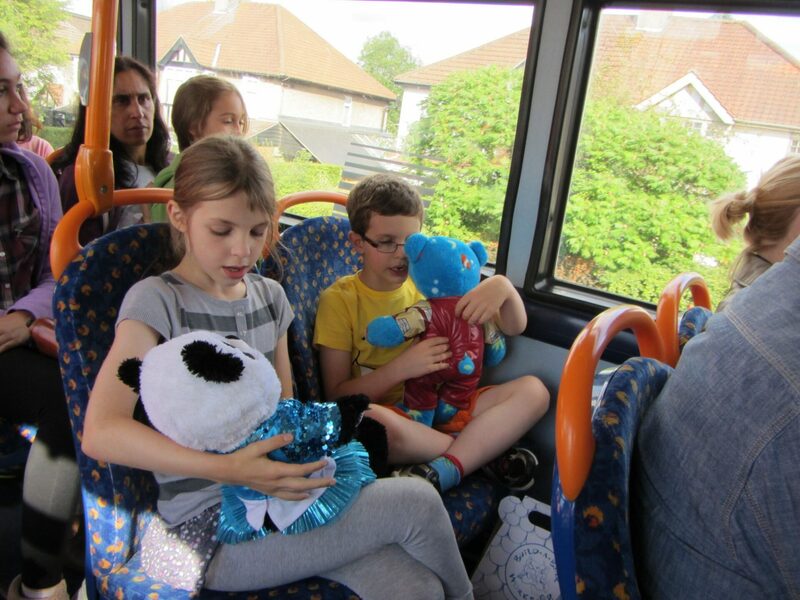 Not only did we leave with two happy customers…. And for the people that went home with us on the bus! Have you been to Build a Bear? What are your thoughts? Would you recommend it? Note: We were provided with the bears in this review for the purpose of this post.. However all opinions are our own, and so is all the love for the bears too! It looks like they had a great time! My oldest is not yet 4, but I was planning to take her as part of her birthday celebrations in a couple of months as I know my nephew loves it there. As you say, the quality is good as he has several (with outfits!) and they’re all still in great condition. The price seems reasonable when you consider it’s a toy and an experience. Though, I am optimistic that as she’s quite young, I may be able to ‘influence’ her choices…!